Bring Thomas the Tank Engine and friends to life with this outstanding water tower steam train set. 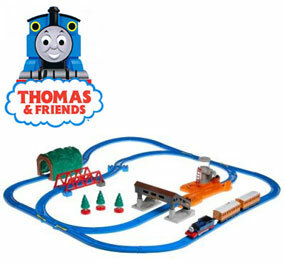 With a total of 39 pieces, this set includes a track, water tower, landscape, and your very own Thomas steam engine as well as Annie and Clarabel coaches to enjoy. As Thomas runs out of steam he pulls up under the water tower and with a press of the pump you can refill him so that he is rearing to go yet again on many more adventures! Best of all he releases cool puffs of steam as he moves along, just like a real steam engine! 14 pieces of curved track. 2 pieces of sloped curved track. 4 pieces of turn out track. 5 pieces of straight track. 2 pieces of half straight track.